I was going to write this post months ago but somehow never got round to it. Thankfully, it's still relevant due to fashion trends being retarded! DENIM DENIM DENIM. It's everywhere! And it makes me want to run into the shops tearing up mannequins! Denim belongs in one place - on the legs. Jeans - great. Denim cut-offs - sure. But anything beyond ankles or waist is just bad. There is one particular shop on Lambton Quay that I cannot stand looking at any longer, because the window display is advertising not only denim, but denim ON DENIM. YUK! And the irony is, the shop is Just Jeans. Well shop, I think you should do as your name suggests and rein in the meandering denim situation! 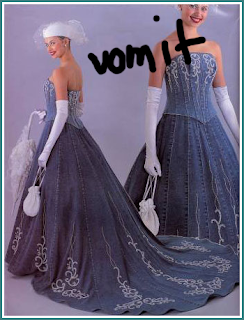 Burn that awful full length denim dress! Melt down that tacky denim waistcoat! Too much of anything is bad, we've said it before, so why is it suddenly ok to plaster yourself in stonewash? Meet Woody. He is a (albeit fake) cowboy. But do you see any denim on denim action going on here? I don't think so. So if the cowboy's aren't going there, neither should we. I was somewhat freaked out yesterday while waiting for my fatty lunch to arrive. While flicking through an Australian Vogue, I stumbled across what is usually my favourite part of a magazine - the part where they take a trendy look and break it down so as to make it accessible to us plebs. But no, this was all wrong. 'How to work the cowboy look'. UGHHH. God forbid I ever see someone walking down the street in blue jeans, brown cowboy boots, denim waistcoat and a cowboy hat! And the tassles, well don't get me started, that's a story for another time. As much as this 'trend' has featured this year, I haven't actually seen anyone (yet) committing such crimes. But summer is on it's way, which means a fresh new bunch of school graduates enjoying their new uniform-free lives. If you see any shredded denim scattered on the streets of Wellington in the following months, you'll know the fashion police (i.e me) have been on duty.